You were doing what at your age? That is the question that I get a lot when someone asks me what happened. I am only 19 years old mentally. Physically, I am 49 years old. I have been distance running, 3 to 26.2 miles, for the last 6 years. I was a taekwondo instructor for 5 years prior to that. I did yoga and interval training. I have done local OC races, 4 Tough Mudders, 2 Spartan Beast races and a Wipe Out run. Plus countless 5k, 10k, and 13.1 milers. So when a running club friend of mine said that he was short some team members for a charity kickball tournament, I didn’t hesitate to play. It is kickball! What could go wrong in kickball? Apparently tearing 50% of my AT from the bone and it shredding up to the muscle can go wrong in kickball. So the general thought process about kickball seems to be that it is a children’s recess game and no one my age should be playing it. Hence, the same question every time I tell someone. I have since discovered, because I have that kind of time right now, that ATR is way more common than I had ever thought. I also now know that very mundane movements can be the initiator. 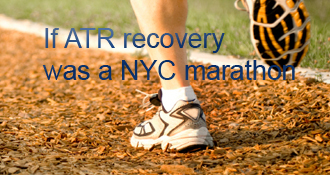 AchillesBlog has given me so much information about ATR and recovery. I was a little depressed about my slow recovery, but I really didn’t have any perspective for my progress. I now see that my OS has me on a fairly aggressive tract. I haven’t started PT yet so I don’t know if things will speed up then or slow down some. I already have decent ROM in my ankle since getting out of my cast 3 days ago. Promise me you’ll play kickball again after you recover! I’m younger than you by over a decade, but tore my achilles on the same general principal: a bit too old to jump into a new physical activity without working up to it. I think that is the biggest lesson I’ve learned from this. Don’t do too much too soon. I guess it maybe isn’t practical to ‘train for kickball’ but I hope once you are back to strength you do just that in order to tell the universe that you aren’t near done yet. Yes, eventually we all have to trade the running shoes, bikes, etc. in for a cane, and we never know when that will be, but from the sounds of things you aren’t ready for that anytime soon, so make it a goal to play kickball and not go down, and then tell us all about it! rtippett’s AchillesBlog is proudly powered by WordPress and WPDesigner..